It’s a dirty trick ice cream shops use to churn out fresh waffle cones, luring unsuspecting passers by with the aroma. The smell is amazing and often makes me forget about the original reason for visiting the shop. This bánh kẹp lá dứa recipe from my beloved mom will let you fill your home with that same aroma and put your housemates into a waffley trance too. 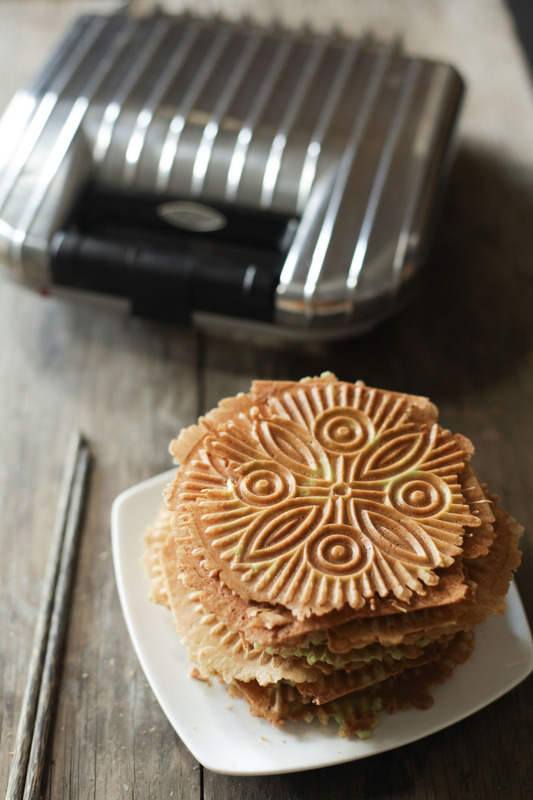 In Vietnamese, bánh kẹp is the same term used for these and waffles. 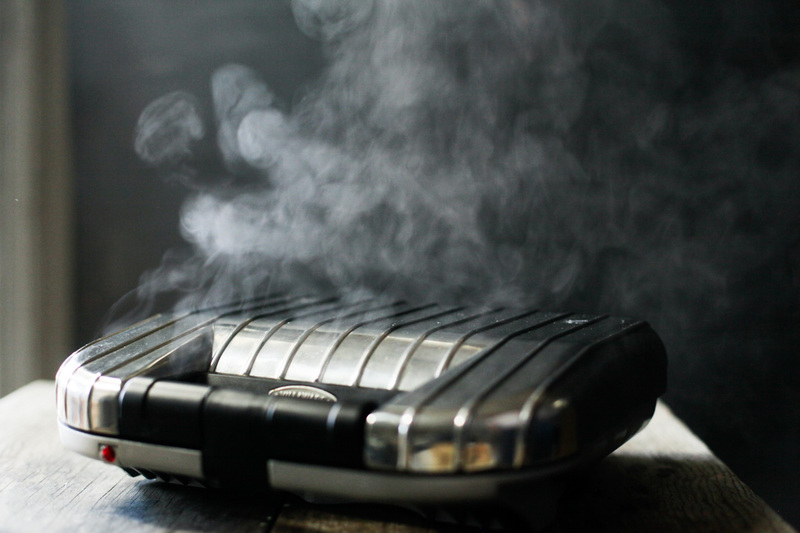 Kẹp is the verb to ‘sandwich’, referring to the pizzelle iron / cooker that sandwiches the batter between the cooking plates. This iron is originally for making traditional Italian cookies called pizzelles, but it’s likely Vietnamese peeps were introduced to it from the French first. Whatever the case, waffles are tough to deny! The aroma and color of pandan leaves are one of my favorites. It was also the star in my pandan sticky rice recipe. Pandan is a very popular flavor, commonly seen in Filipino and Thai desserts too. If you have the option to pick up these leaves from a nearby asian market, make every effort you can to get you hands on it! In a pinch, artificial pandan extract can work too. The extract adds aroma and a deeper food coloring which is more difficult to achieve than by just blending the leaves. Start with about eight pandan leaves, and 1/3 cup water in a blender and blend until you no longer see large bits of the leaf. 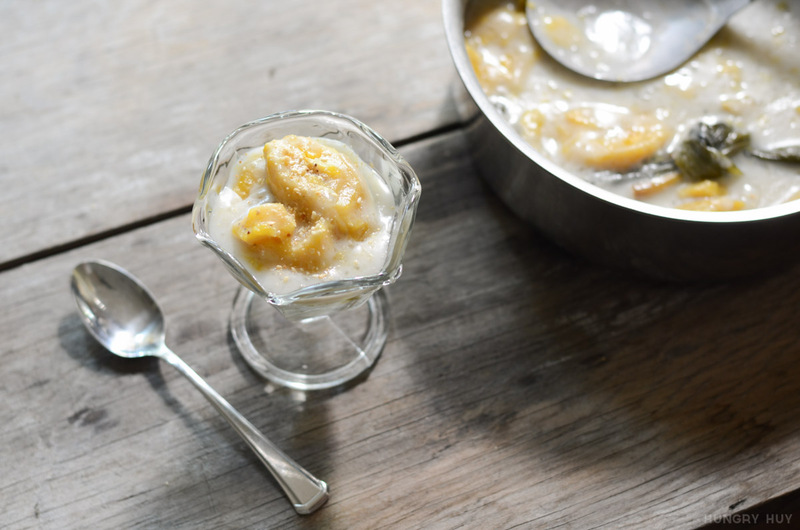 Remove the pulp with a strainer or sieve and squeeze out any remaining liquid in it. More leaves and less water will get your liquid more concentrated, but go too far and it’ll taste bitter. This will not work well in a food processor. Prepping the batter for these pizzelles is super simple after that. Just melt the butter, measure out ingredients then dump them all into the blender to mix. You want to wait about two hours before using the batter to let the flour settle and expand a bit. You can even prep this ahead of time and store it sealed airtight in your fridge for about a week. When you’re ready for some bánh kẹp, just heat up your iron, spray oil on it before each batch and ladle on some batter. 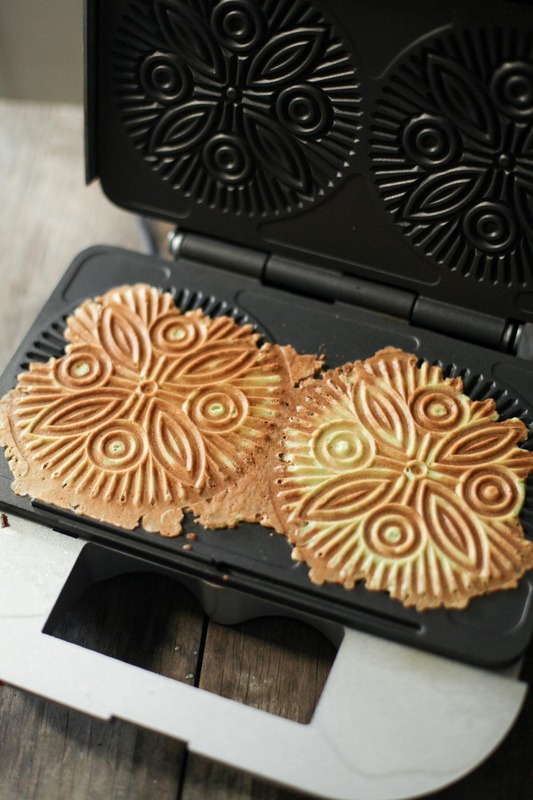 The thinness of these makes cooking them super quick but can vary based on your pizzelle iron . Make a few of these to see what temperature settings and cook time get you a consistency you like! When ready, the cookies will be slightly soft and malleable hot off the iron, and crisp up after they cool. While they’re still hot, you can roll them into cones, tubes, or simply leave them flat. I like them flat so it makes less of a crumbly mess when snacking on em. Pardon the inconsistencies in batter pouring in these photos…lol. And yesss, while these are delicious just for snacking on their own, they will take your ice cream game up another level. I love these with vanilla ice cream. I typically go for the super premium ice creams when snacking out of the cartons, but when paired with one of these waffle cones, premium and less dense ice creams like Dreyer’s and Breyer’s will do just fine. This easy banh kep la dua recipe will fill your home with the freshly baked waffle aroma. 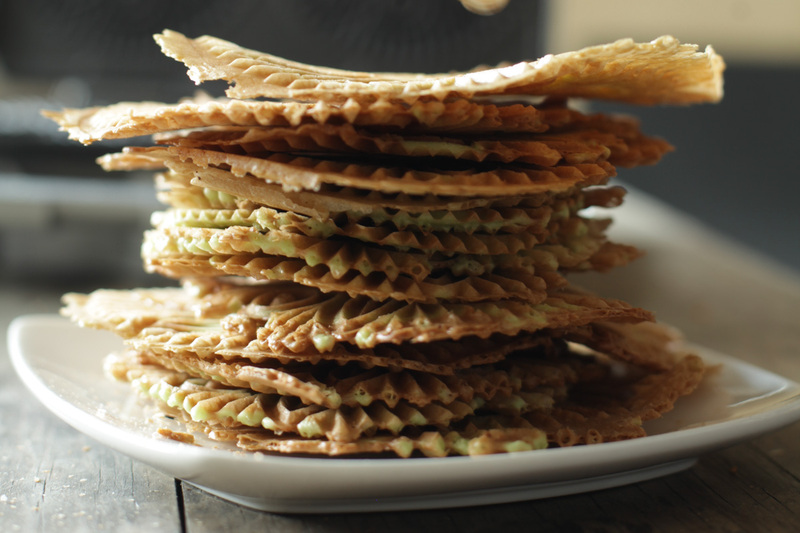 The la dua (pandan leaves) make these pizzelles even better! Cut your pandan leaves into 3-4 inch sections, add to blender. Add water to blender, and blend until you no longer see large chunks. Strain the pulp, reserve the remaining liquid, and squeeze out any liquid inside the pulp too. 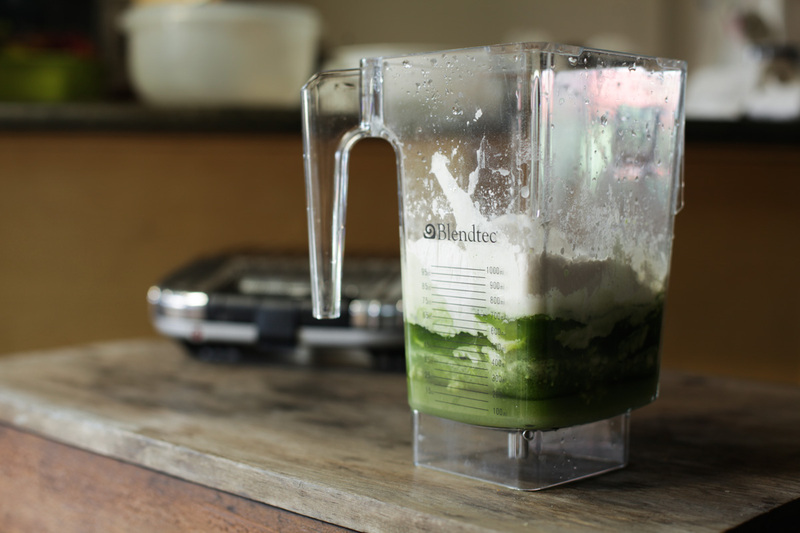 Rinse out your blender's jar for the next step. Melt butter in a microwave, then let it cool for a minute. 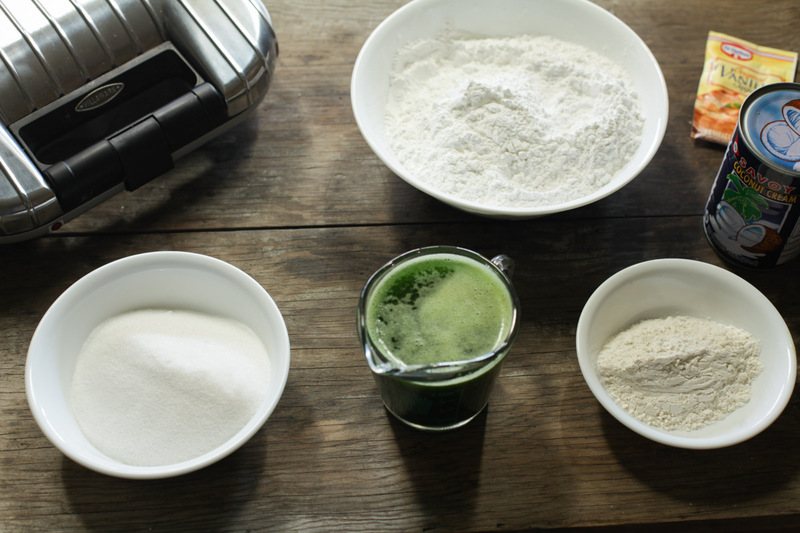 Add butter and all remaining ingredients except sesame seeds into the blender. Pulse the blender to combine, scraping down the sides as necessary. Don't blend more than you need to make this homogenous. Cover the batter and let it rest in the fridge for at least two hours. 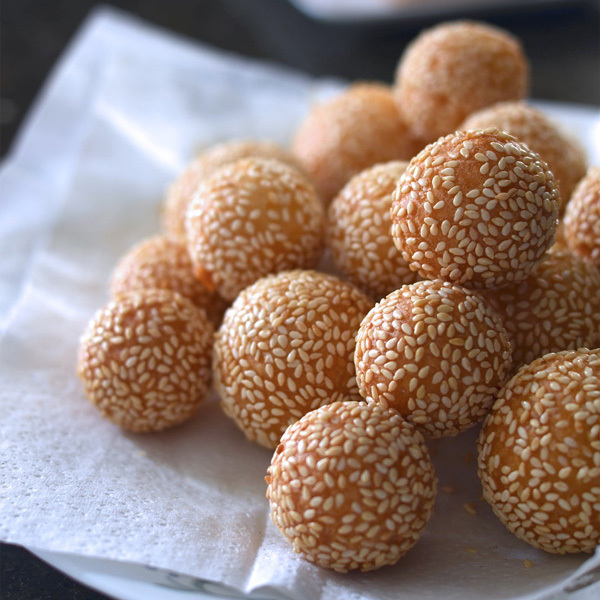 If you're using sesame seeds, add these to the batter just before cooking so the colors don't run into the batter. Warm up your iron, use a quick mist of nonstick spray or oil on the iron if needed ladle on some batter and let it cook. Adjust your heat settings and cook time as necessary for desired brownness. These will crisp up shortly after removing from the iron, so roll or shape them as you like while they're still soft.